An Orange County Wedding Photographer is in for a treat at the Arrow Park Lake and Lodge. The Arrow Park Lake and Lodge is a gorgeous, private event venue in Monroe, New York. 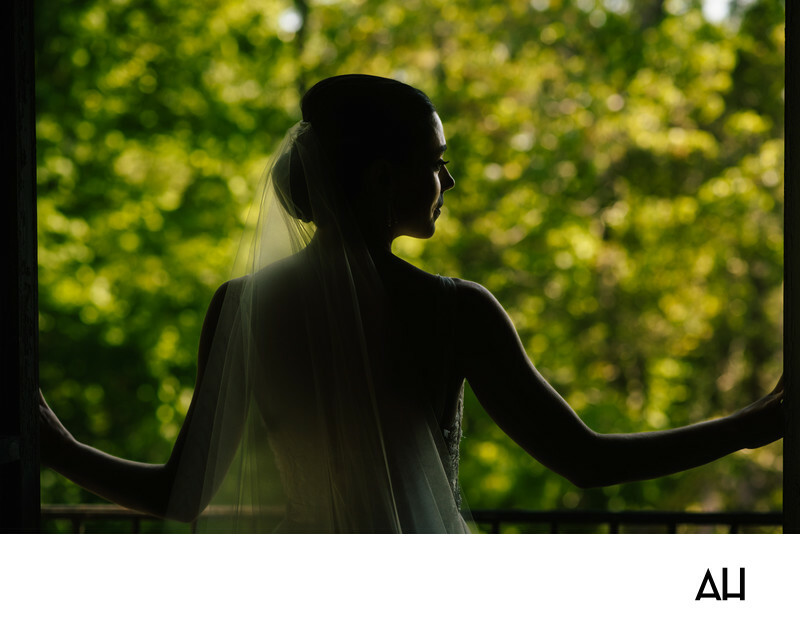 With its lovely natural views, grand house, and exceptional venue spaces, Arrow Park is a perfect place for a wedding and for an Orange County Wedding Photographer. In this picture from an Arrow Park Lake and Lodge wedding, the bride stands at the opening of the balcony of her lodge room. As the bride opens the doors to the balcony, she is greeted by a sea of green. Standing here, the bride looks like a princess in a fairytale, looking out over the natural beauty of her kingdom as she prepares herself for her wedding day. Her prince, the groom, awaits, but for now the bride is taking this moment to breathe in the loveliness that surrounds her and to mentally ready herself for the events of the day. The bride is graceful and poised in her stance, as she elegantly poses in her room. Her figure appears mostly as a silhouette, with the dark of the room behind her and the bright shining sun beaming down before her. She wears her wedding gown, and her veil flows from the top of her low bun down her back in a cascade of sheer fabric. The bride’s expression is contemplative, as she observes the nature in front of her and thinks about the ceremony and reception that will soon come. After this day she will not just be a bride, she will be a wife to the man she loves most in the world.